Skansen Lejonet in Gothenburg - A fortress in Gothenburg with a lion on the top. 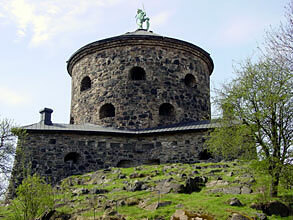 There are two redoubts in Gothenburg, the thing that divide them is the symbol in the top. One has a lion and the other one a crown. They are Gothenburg´s old defence redoubts from the end of the 1600´s. 1639 in the city council, a proposal was given. The mountains around the city should have redoubts to "insure the city". Skansen Lejonet or Skansen Westgötha Leijon or the real old name, Gullberg Skantz. Before the skans was placed here some other defence redoubts have been at this place. During a certain time the rock was without any defence. It was not until King Erik XIV 1568 gave orders about that the rock should have a defence. Then thing started to happen. Skansen Westgötha Leijon started to be built June 22, 1687. 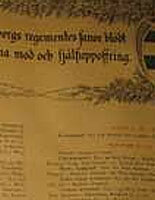 The inauguration was perform by the King XI 1689, but the Skansen was not completely done before year 1694. The architect Erik Dahlbergh has made the design of Skansen and also Skansen Kronan. The walls are 22 feet thick and the building have two floors. Skansen has never been involve in any battle. When time passed the fortress lost it´s value within the army. Skansen was later also used as a place to live in and also used as a storage and eventually was left to its fate 1942. At the 1970´s some raise the proposal to renovate Skansen Lejonet. After a long time of work King Carl XVI Gustaf inaugurated the Skansen Sept 4, 1974. 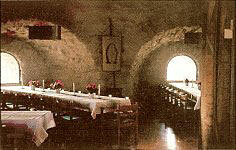 Today it´s the association " Götiska Förbundet" who has the contract to take care of Skansen. 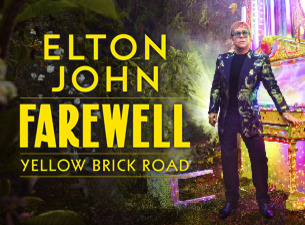 They have the contract in 50 year since they started year 1975. Their contract will end year 2025. The lion at the top. Year 1692 the Skansen got a tower ornament, a lion with a gild crown that is holding a sword in his right paw. Later on the lion was replaced with a wooden ball. Year 1891 was the warmest and hottets summer in many many year and at the swedish public holiday, at midsommarafton the myth says that a spark from a steam engine should have set fire on Skansen´s roof. Skansen were at this time unmanned so they let it burn. After this they decided one time more to put a new lion at the top again. Eugen Thorburn draw the 13 feet hig new lion in copper. The new lion was placed at the top in Oct, 1893. What happens today in Skansen? Today the upper floor is a big hall for different gatherings. On the second floor you can have gatherings for dinner and it can also be rented for private gatherings of different kind. What a struggle: Image how hard and though is must have been to built Skansen. To drag a whole numbers of stones.....without the help that we have today. Skansen Lejonet official website. Note!not in English.